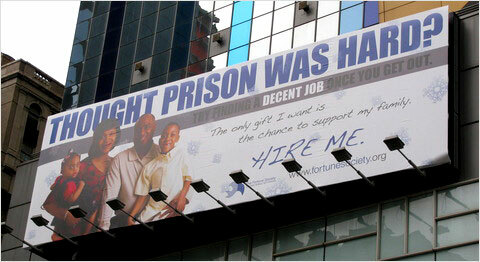 A new billboard in Times Square is intended to help people with criminal records find jobs. Just in time for the ball drop and the New Year's revelry is an unusual addition to the Times Square landscape: a billboard that encourages employers to hire people with criminal records. The advertisement, which sits on top of the Westin Hotel at Eighth Avenue, between 42nd and 43rd Streets, was bought by a nonprofit group at a discount -- a bargain $15,000 for a minimum of four weeks. Usually, the billboards in Times Square go for $35,000 for a similar period. "It's only because of the recession" that the opportunity for the advertisement came about, said Glenn Martin, a vice president at the nonprofit group, the Fortune Society, which helps people who have been incarcerated re-enter mainstream society. Under state law, it is illegal in most cases for employers, with the exception of law enforcement agencies, to discriminate against hiring someone solely because of a criminal record. Though the law has been in place for about three decades, it is weakly enforced, said Mr. Martin, who is himself a former offender. The Fortune Society drafted a measure, which has since become law, requiring employers to post in the workplace notices banning discrimination against inmates and requiring that the subject of a criminal background check receive a copy of records obtained by a prospective employer.